The Southern Cross Pearl also known as the Great Southern Cross Pearl, is a natural cluster of nine pearls discovered in the pearl oyster species of the South Sea, Pinctada maxima, in Western Australia in 1874 or 1883. The unique feature of this cluster of natural pearls, was the remarkable arrangement of the pearls to form a Latin Cross of unbelievable and perfect proportions, which for the faithful was undoubtedly a divine miracle, but for the skeptic just another freak of nature. The cruciform cluster of pearls acquired the name Southern Cross or the Great Southern Cross, perhaps because it was discovered in Australia, in the Southern Hemisphere or because of its resemblance to another natural cross-like formation in the star-studded skies of the Southern Hemisphere, the constellation popularly known as the "Southern Cross," which is clearly visible in the skies of Australia. The Southern Cross pearl cluster, consists of a group of nine pearls, believed to have grown together naturally inside the pearl oyster species Pinctada maxima, in a strikingly regular manner to form a Latin Cross of perfect geometric proportions, whose appearance is too good to be considered natural. The shaft of the cross which measures 1.5 inches (3.81 cm) in length is made up of 7 pearls, whose diameter decreases gradually from top to bottom, from the second pearl downwards. The topmost pearl has a diameter almost equal to the bottom most pearl. The two arms of the cross are formed by a single pearl on either side and almost opposite to the second pearl on the shaft from the top, which incidentally is the largest pearl on the cross. The boundaries of the pearls in the cluster are clearly demarcated by depressions on the sides of the shaft. The luster and iridescence of the pearls are quite good, but the individual pearls are not spherical, because of the mutual compression the pearls were subjected to during their growth, causing them to be flattened on opposite sides, at the points where they met one another. The pearls have thus become barrel shaped, except at the extremities of the cross, where they are almost drop-shaped, as compression was felt only on one side. The pearls are slightly flattened at the back, perhaps due to the cluster forming close to the shell, within the fleshy mantle of the host oyster. Under the present-day classification of the shapes of pearls, the individual pearls in the cluster clearly fall under the category of baroque pearls. Taken individually the pearls may not have much value, but the unique composite structure in the form of a Roman Cross of perfect proportions, has an inestimable value, being the first of its kind ever discovered in the world, believed to have been formed without any form of human intervention. This is in contrast to the famous Buddha pearls, that were cultivated by the ancient Chinese, by implanting tiny figurines of the Buddha inside the pearl oyster, which acted as the nucleus. The cluster of pearls was later set in a simple gold mount, leaving the back and front face of the cross perfectly free, and was exhibited at several international exhibitions around the world. Our main sources of information on the history of the Southern Cross Pearls, comes from two world renowned authorities, both of whom were involved during their life time with minerals and gemstones, and were specialists and recognized authorities in their own fields, having many authoritative publications to their credit. One was Edwin W. Streeter, the renowned diamond and gem dealer with business interests in London and Ceylon (Sri Lanka), who towards end of his life also engaged in pearling activities in Western Australia. Streeter did lot of research on diamonds, precious stones and on the history of famous diamond and gemstones, and published several books related to these fields. One of the books written by Streeter was "Pearls and Pearling Life" which was published by George Bell & Sons in 1886. and in which he had dedicated a chapter (chapter XVII) to the Southern Cross Pearl. The other international authority on gemstones and minerals was George Frederick Kunz (1856-1932), a self-educated geologist, mineralogist and gemologist, whose interest in minerals from a very young age, led to a life time dedication to the study of minerals, and made him a world authority on the subject, and whose expertise was much sought after by institutions like the U.S. Geological Survey and the renowned jewelers Tiffany & Co., who engaged his services. During his life time Kunz published several books and wrote over 300 articles for prestigious journals of science, such as the American Journal of Science and the American Mineralogist. In 1908, Kunz together with Charles Hugh Stevenson, published the book, "The Book of the Pearl : its history, art, science and industry," in which he discusses the history of the discovery of the Southern Cross Pearl and its characteristics on page 466. According to the version of events leading to the discovery of the Southern Cross Pearls given in Edwin Streeter's book, the cluster pearl was discovered in 1874 by a man named Clark, while pearl-fishing in a schooner at Roeburn, in Western Australia. When the shell was opened by Clark in the presence of Shiner Kelly, the owner of the schooner, what turned out inside caused shock and amazement and a sense of awe, among the pair, both of whom were devout Roman Catholics. The pair were convinced that this was indeed a heaven-sent miracle, and out of fear buried the cross of pearls, for an unspecified period of time. It was later taken out and sold, and after that the pearl changed hands many times, the price increasing each time by a hundred percent, until it became the property of a syndicate of gentleman in Western Australia. Apparently one of the members of this syndicate was Mr. F. H. Cheesewright, at whose instance Mr. Edwin Streeter was persuaded to take the pearl cross to England, in order to give it the publicity it deserved. In the year 1886, the miraculous pearl formation was exhibited in the Western Australian Court of the Colonial and Indian Exhibition, set in a simple gold mount, that left the front and back of the cross perfectly free. The syndicate valued the pearl at Â£10,000, given the unique character of the pearl formation, the only one of its kind in the world. Streeter then goes on to say that many visitors who had seen the Southern Cross Pearls at the exhibition, and did not have the opportunity of closely inspecting the cross, might have been disposed to entertain the opinion, that the cluster was artificially grouped together, given the geometric regularity in the grouping of the pearls. He says that the examination of the cross under high magnifying power was sufficient to prove that the skeptics notion of its artificial character was unfounded. Streeter then gives an interesting narration of how he and Mr. A. F. Thompson of the West Australian Court, organized an exhibition of the cross on July 29, 1886, at No. 18 New Bond Street, London, with a view of subjecting the cross to severe scrutiny, particularly by members of the scientific community. A large number of scientific and literary men, colonists and Indians, attended this special occasion by invitation, to inspect this strange curiosity. Streeter had made arrangements for a powerful lime-light to be projected on an area where the cross was to be examined, and had provided powerful magnifying glasses to assist in the examination. The cluster pearl was allowed to be handled freely by anyone who wished to examine it very closely, and express an opinion. The close scrutiny to which the cross was subjected, with powerful magnifying glasses, under strong artificial illumination, by several independent observers might have easily detected any artificial junction between the pearls, or any trace of an artificial cementing medium. Streeter goes on to say that the cross came out of the ordeal without a shadow of suspicion, and was pronounced to be a 100% natural creation of unique character. No satisfactory explanation of how the pearls came to be arranged regularly during its formation inside the Pinctada maxima pearl oyster had been forthcoming, but a plausible explanation had been put forward by one Dr. MacLarty. According to him a serrated sea-weed might have gained access into the oyster, and served as a nucleus around which nacre was deposited. The occurrence of teeth at regular intervals along the margin of the frond, caused the deposition of nacre at regular intervals, forming a string of pearls running in a straight line. Pinctada maxima, the South Sea pearl oyster, being the largest pearl oyster species in the world, that could reach a maximum length of one foot (12 ins or 30 cm), might have easily accommodated such a nucleus which was only 1.5 ins (30 cm) in length. Streeter further goes on to assert, that whatever may have been the determining cause, it seems clear that the cross was a perfectly natural one, without being subjected to any human manipulation. Discovery of the pearl by Clark in 1883. The information given by George Frederick Kunz in his book, "The Book of the Pearl" relevant to the discovery of the pearl, was derived from Henry Taunton's account of his wanderings in Australia, published in "Australind" in 1900. According to this version the pearl cross was discovered actually on March 26, 1883, off Baldwin Creek, in Latitude 17Â°S and Longitude 122Â°E, by a boy named Clark, who was in the employment of James W. S. Kelly, a master pearler. At the time the pearl was delivered to Mr. Kelly, it was in three distinct pieces. The boy however reported that it was in one piece when he found it a few hours earlier. Kelly sold the pearl in the form he received it, in three pieces, to another pearler named Roy for 10 pounds. Roy in turn sold it to a man named Craig for 40 pounds, who eventually sold it to the Australian Syndicate. Taunton further goes on to reveal that originally when the pearl was delivered to Kelly by Clark, and later when Kelly sold it in 1883 the cluster had only 8 pearls, as the right arm of the cross was missing. One of the subsequent owners of the cluster pearl, who is not identified in Taunton's account, decided to look for a pearl of suitable size and shape, to take the place of the right arm, in order to make the cluster resemble a well-proportioned cross. They searched the pearl markets of Cossack, the hub of the pearling industry in Western Australia at that time, from where the pearling fleets operated, and without much difficulty secured a pearl of the right size and the required convexity, for about 10 or 12 pounds. What remained now was putting the pieces together skillfully, with the help of diamond cement. At first the three original pieces were joined together with diamond cement, making two artificial joints. Then the selected pearl for the right arm of the cross was attached to a natural hollow on the central pearl, and the cluster was transformed into a perfect cross, with three artificial joints. Kunz also states that the Southern Cross Pearls was first exhibited at the Colonial and Indian Exhibition at London in 1886, and later at the Paris Exhibition in 1889, where it attracted much attention, and obtained a gold medal for exhibitors. He also mentions of a move to purchase the pearls for Â£10,000, to be given as a gift to Pope Leo XIII in 1896, during the 18th year of his papacy, but does not say whether it actually materialized. He further states that he has no information on the present (1908) location of the cross. There are many contradictions in the two versions of the history of the Southern Cross Pearls, as given by Streeter and Kunz. While in Streeter's version the cluster pearls were discovered in 1874, in Kunz's version the exact date of discovery is given as March 26, 1883, which was nine years later than in the first version. Again Streeter's version says that Clark discovered the shell, but it was opened in the presence of Kelly, and they later buried the cluster for an unspecified period of time. In Kunz's version the cluster was discovered by Clark alone, who later delivered the cluster in three pieces to Kelly. According to Streeter's version the cluster was discovered in the form of a perfect cross without any human manipulation. But, in Kunz's version the cluster was discovered in one piece by Clark, but later in trying to retrieve it broke into three pieces, in which form it was later sold by Kelly. Kunz's version further says that the cluster had only 8 pearls at the time of its discovery, and the ninth pearl in the form of the missing right arm of the cross was added later. Thus according to Kunz's version, there are three artificial joints in the cross created by diamond cement. Thus the essential difference between the two versions is that, Streeter's version depicts the Southern Cross pearl cluster as a 100% natural creation without any human manipulation, whereas Kunz's version tries to show that there was indeed human intervention in the creation of the Southern Cross Pearls, by creating two artificial joints to assemble the three pieces together, and a third artificial joint to create the right arm of the cross. However, whether there had been human intervention or not in the Southern Cross Pearl Cluster, a study of the shapes of the individual pearls both at the extremities of the cross and other places, lends strong evidence to their natural provenance. 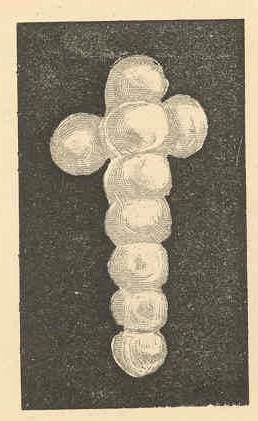 The flattening of the pearls on opposite sides due to mutual compression caused during the growth of the pearls, resulting in barrel-shaped pearls in the middle and drop-shaped pearls at the extremities, where compression was present only on one side, is a strong line of evidence for the natural provenance of a major part of the cross. The present whereabouts of the Southern Cross Pearls ? After the display of the Southern Cross Pearls at the Colonial and Indian Exhibition of 1886 and later at the Paris Exhibition in 1889, where it won a gold medal, the next time the renowned pearl formation made its appearance was in 1924, when it was the star exhibit at the Great Wembley Exhibition held in London. In 1933, the Southern Cross Pearls was reported to be in the possession of C. P. Bennett, a London merchant. Since then the whereabouts of the pearls are not known, and in the year 1994, Philip Pendal, a West Australian Member of Parliament, was reported to have searched for it in England, probably with the intention of acquiring the renowned cross and taking it back home. A web article titled "Pearl : Queen of Gems" written by Vimukthi Fernando, and appearing on the website www.lankalibrary.com claims that the Southern Cross is now in the treasuries of the Vatican, but the source of this information is not given. The "Southern Cross" constellation known as "Crux Australis" was not considered as a separate constellation by ancient Greek and Arab astronomers, but as part of the Constellation Centaurus, forming a foot of the Centaur. The four bright stars in the constellation that formed the extremities of the cross, was so brilliant in the southern hemisphere, that eventually in the early 17th century, "Crux Australis" was recognized as a separate constellation, perhaps the smallest in the entire sky. The constellation also has a fifth bright but smaller star. The five stars are labeled using the Greek Alphabet, as Alpha Cruxis (Acrux), Beta Cruxis (Becrux or Mimosa), Gamma Cruxis (Gacrux), Delta Cruxis and Epsilon Cruxis (ε-Cruxis). The Alpha Cruxis is a binary star with a combined visual magnitude of 0.72, and occupies the lowest end of the cross. Beta Cruxis is the brightest star of the group, a blue-white star with a visual magnitude of 1.25, and occupies the left extremity of the cross. Gamma Cruxis forms the head of the cross and is an orange looking star. Delta Cruxis is the faintest of the four stars and occupies the right extremity of the cross. The fifth star situated between Alpha Cruxis and Delta Cruxis, is known as Epsilon Cruxis. The first three stars, Alpha, Beta and Gamma Cruxis are the brightest of all the five stars, and Beta Cruxis is the brightest of the entire group. The visibility range of the "Crux Australis"
The "Crux Australis" is mainly visible in the Southern Hemisphere and in the tropical latitudes of the Northern Hemisphere near the horizon during the winter months. The visibility range is between latitudes 20Â°N and 90Â°S (between +20Â° and -90Â°). There are no Greek myths or legends associated with this constellation, probably because the group was not identified as a separate constellation or because of its non-visibility or insignificance in the skies of the Northern Hemisphere. However, there are many legends associated with the constellation in ancient cultures of the Southern Hemisphere such as the Australian Aborigines, the Patagonian Mapuches, the Incas of Mesoamerica, the Maoris of New Zealand, the Tuaregs of the Sahara, the ancient Hindus of India and cultures of Indonesia and Malaysia. The astronomical significance of the "Crux Australis"
The astronomical significance of the "Southern Cross" is that in the absence of a Southern Polar Star to indicate the Southern Celestial Pole, two stars of the constellation, Alpha Cruxis, and Gamma Cruxis are used to find the position of the Southern Celestial Pole. A line constructed perpendicularly between Alpha Centauri and Beta Centauri that intersects the extended line joining Alpha and Gamma Cruxis marks the Southern Celestial Pole. The "Southern Cross Constellation" is the most popular constellation in Australia, and is a symbol in the Australian flag, the four most prominent stars in the group representing the four moral virtues of Justice, Prudence, Temperance and Fortitude. The symbol is also used in the flags of the Australian States. 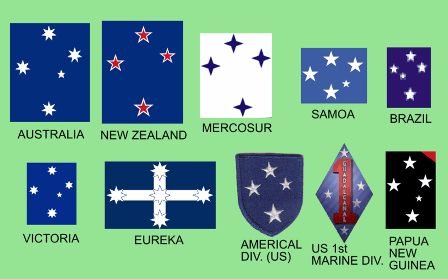 It is also used as a national symbol by several other nations of the Southern Hemisphere who have incorporated it in their national flags, such as New Zealand, Papua New Guinea, Samoa and Brazil. It is also used in the flags of the Magallanes Region of Chile, several Argentinean provincial flags, and the flag of Mercosur Trading Zone. In Brazil the Southern Cross also appears on their coat-of-arms. 1) The Southern Cross Pearl - Chapter XVII, Pearls and Pearling Life, by Streeter E.W.